Sprint has killied the Nextel Motorola iDEN network in the United States. That’s too bad, but if you have a pair of Nextel phones you can turn them into very good two way radios that will function even without the cell phone network. 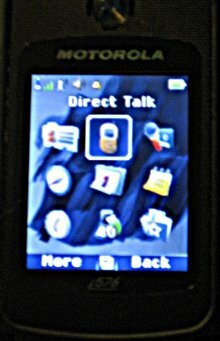 Many, if not all newer Motorola Nextel phones have the “off network mode” also known as MOTO Talk which turn the phones into walkie-talkies completely independent of the phone provider’s network. The radios don’t use encryption, although the privacy settings allow users to communicate with select private groups and to individual units. A SIM card is mandatory, although network service is not. I suspect any SIM card will do the trick. Without one the phone just hangs up at a screen that ask to insert a SIM card. I tested a pair of Motorola i576 phones in an urban low-rise environment with hills and natural and man made obstacles occluding the line of sight. One unit was stationary and another was in a moving vehicle. I was able to transmit and receive completely clear voice up to one mile (1.5km) distance. It is reasonable to expect that in a line of sight applications the range would be far greater. The range may also depend on the model of the phone. To enable the off network mode simply go to the phone menu, turn the Direct Talk on and make sure the channel selection and privacy codes are matched on all the units you intend to use. When the Nextel network is finally shut down in 2013, all these iDEN phones will flood eBay and there will be a lot bargains out there. Thanks for the note Emily. I miss using these phones. I mean, I like all the conveniences of a smartphone, but i576 was such a great small phone with a powerful speaker. It wasn’t as sturdy as the design would suggest, but it did ok. I just looked on Ebay. They sell for $20-30 which is surprisingly high. Do you happen to know if the off-network 2-way mode uses encryption? They are frequency hopping. Anyone listening in would have to have identical phones with the same channel settings. Thanks Thomas, that’s good to know. How can I get my i530 phones to work the same way? I’m not sure if they can work off-network or not. I’m not familiar with Nextel i530. Does any body have any links to these phs now for sale would need a matching pair? I have a pair I’m not using, but I don’t know… I feel I should shed some junk, on the other hand I kind of feel I should hang onto them. hey i read your comment the u might have some sextet phones would u maybe be willing to sell them? i am a guardian angel chapter leader in nye n really could use them. please fell to call to text me at 718 908 4799 thank for your time deezo. You have a set of Nextel’s? if there is hard wer ?? I still have an i415. Would it work? One of the best on the side of a noisy freeway could be heard over the noise better than the company-issued flip-phone. I don’t know. It’s been a very long time since I played with Nextel phones. None of those phones will work with this. However, the i850, i870, i580, and many other models will work with this. Many of these phones can be found online for decently cheap. Does anyone know how to re-enable this mode on a used Southernlinc phone which ship with the feature disabled?